Sending the Bike West ..
My bike arrived yesterday in Colorado. Next week I’ll be joining it for some fun in the Rocky Mountains. For now, I’m hanging out in the rainy and hot Southeast, doing some cross-training to keep myself in decent riding shape. To my surprise, a number of people have asked about the process of shipping the bike cross-country. I had no idea there would be such interest in such a mundane topic, but I guess it is not something that is done all the time. Why not blog about it, eh? This was a new experience for me. I did my research, found out the cost, and weighed that against the alternatives. The only real alternative in this case is to rent a bike while there. Even though shipping is an expensive process, it was a better for option for me. Rentals for a comparable bike run high, close to $100 a day where I would be. Most rentals are for 24-hour periods. Since I will be there for a total of ten days, that could add up. If I decided to skip a day or two, I would have to take it back to the shop, then get re-fitted when I rent again. It would be expensive, inconvenient, and I would most likely not get a comfortable bike. The decision was easy. My gorgeous Cervelo would get a taste of the Colorado Fourteeners. Since I have no mechanical ability whatsoever, the first step was to get the bike dismantled and into a box. My good friends at Summit Cycles were happy to oblige for $50. 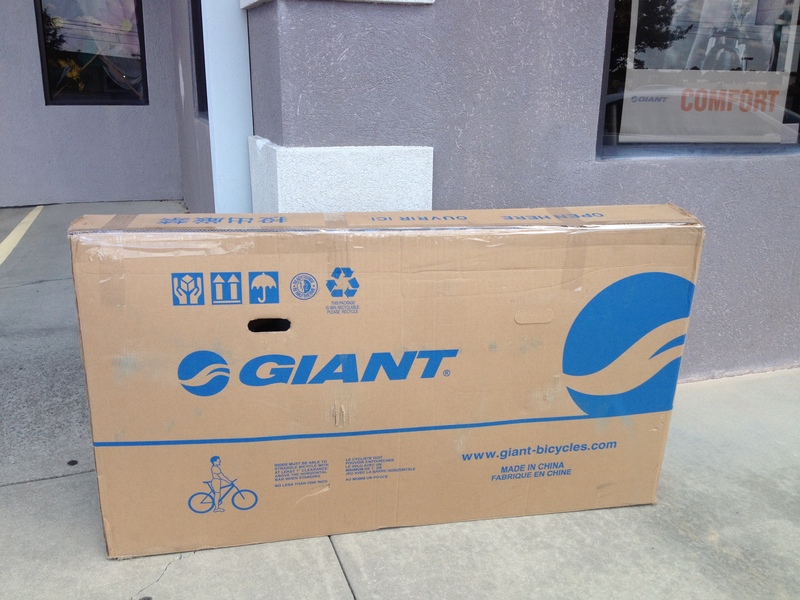 I would need to find a bike shop at the other end that would receive the bike, unbox and put it back together. Big Ring Cycles in Golden, CO is doing that for me for another $50. They will also give it a minor tune-up while rebuilding, and do a re-fit when I pick it up. When Summit finished, they sent me on my way to Fedex. I lugged this gigantic box into the nearest Kinko’s and placed it on the scale. It weighed 25 lbs, heavier than I expected. He asked the value and I gulped. This is not exactly a cheap bike. I wasn’t crazy about revealing the cost to a stranger, but I had to insure it for the proper amount. When I told him, he blinked. He then looked inside the holes in the box, trying to figure out what was so special about the dismantled carbon fiber inside. “You’re serious about cycling, aren’t you?” he asked. Yep. He then proceeded to ask me if I thought Lance Armstrong doped, which is pretty much what every non-cyclist asks me. The total for shipping was $98. Yikes! I’ll be looking at roughly the same price to return it. That added to the reboxing and unboxing, will make this whole thing in the $400 range. It is certainly expensive, but this is a vacation, and I will have the bike I love so much for 10 days in the Colorado mountains. I cannot complain about that. The next question was the timing. Colorado is a thriving bicycle community, and I could tell when reaching out to their bike shops that they had a lot of ongoing service work. Not only did the package have to beat me to Colorado, but it had to get there early enough for them to have the time to rebuild it. The last thing I wanted was to show up and it not be ready. In light of this, I probably sent it a little too early. I sent it Monday. It arrived Thursday. I’ll arrive next Friday. So the bike shop has a week to do their work, plenty of time. As it turns out, it has rained just about everyday I’ve been without a bike. It is weird with it not being around, but I haven’t actually missed it. I take comfort knowing that it’s a mile-higher than me, waiting patiently. This entry was posted on Friday, July 20th, 2012 at 4:50 pm	and tagged with bike, cost, cycling, denver, shipping, south carolina and posted in Blog. You can follow any responses to this entry through the RSS 2.0 feed. Breaking a bike to ship is very easy. How much extra would it have been to just check it as luggage? Not sure, but I was strongly advised by my bike shop not to go that route. They had customers who had tried and found their bike thrashed. One day I may learn to break the bike down, but right now I do not trust myself. Looking forward to reading all about Colorado, Aaron. Re traveling with bikes, I’ve nearly also had something broken or bent when flying with it as checked baggage, but that could be just bad luck. Thanks, Gerry! I’ve seen too many bags of luggage thrown at airports. I don’t want some guy chucking my Cervelo. Also looking forward to reading about Colorado … sounds like you’re starting in Golden? You should find some great climbs thereabouts. Thanks, Suze. Starting in Denver for the first couple days to acclimate, then in Breckenridge the rest of the stay. So far I’m still working on the climbing menu, but I promise it will be spectacular. I have a hard plastic bike container that I put the bike in, and it flies on the airplane with me. It cost ~$100 used. Airlines charge anywhere from $50-$400 (each way) for bringing the bike along, but if you do your research on which airlines are the cheapest beforehand you can save a few bucks. Also, some bike boxes won’t even be charged the oversized fee, so if you get one in the future, try to get something compact and light, and then its just the cost of a normal bag. It takes me about 30mins to pack up the bike (Take stem/handlebars off fork, leave dangling, take wheels off, take seatpost off is only assembly required). Less time to unpack. And then you don’t have to give up riding, because the bike is always with you. Enjoy Colorado, I would love to ride out there some time. Hey James. Well the good news is the bike is in good shape and now waiting for me in Colorado. I’ll probably have to return it the same way I sent it, but I may look into a bike box for future adventures. See http://www.bikeflights.com. They have pretty good rates. They basically negotiate out the oversize fees on shipping through all the same major carriers. Nice! Wish I had seen this a couple weeks ago. Maybe I’ll give this a try for the way back. If not, next time. Thanks for sharing. I remember the good old days when we got free airline vouchers with an annual USA Cycling license. I flew with my bike many times in the early to mid 2000’s for free. Guess those days are over. Enjoy your trip.